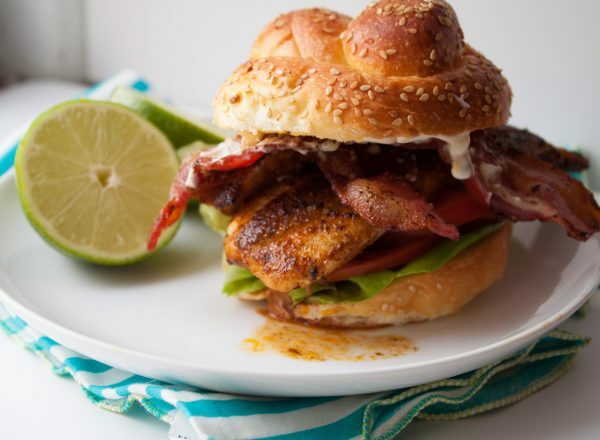 This lightened up cajun tilapia sandwich has bacon and lime mayo and so much flavor! It’s a restaurant quality fish recipe for 350 calories! I think when you begin to love someone, it’s just part of the natural progression of things to probe them endlessly to figure out everything they like to eat. And everything they hate, too. I ask questions about food preferences immediately — in friendships, in love — mostly because, well, let’s not get hurt later on. “Cake or pie?” And they think, even when the answer’s easy. “But if you were forced, at which of the fast food chains would you eat for the rest of your life?” They shudder. “Which doughnut really defines you, though?” I judge them. I pray it won’t be pasta. God please not pasta. And then, of course, there’s the matter of the clash. We just can’t like the same things all the time, at least not all the way. Kate will always like ice cream cake. Sabrina will crave things doused in vinegar and hot sauce. My family will scrub the counter with my tofu. Daniel will insist that Qdoba is better than Chipotle, even when there’s quite simply no way. And not a one of them will indulge in any seafood outside of the safe New England net of shrimp, scallops, lobster, and haddock. Salmon? No. Not tilapia, not sea bass, not halibut, certainly not mahi mahi. So here I am. Making cajun tilapia for one. Not sad, just something. We do what we want, don’t we? This sandwich. First, it’s loaded with flavor, which I know we all love. Step one is to create a straightforward cajun spice blend that you can store in a small jar for later use on fish, chicken, pork…anything. It’s fantastic. Added to that bold, spicy kick is bacon, which is always a joy, isn’t it? Salty and crisp and a perfect companion for the flaky tilapia. 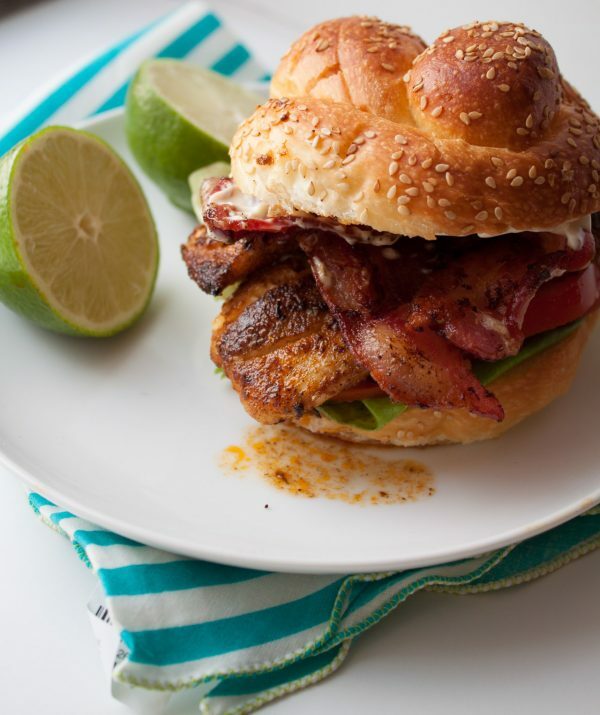 A quick cilantro lime cream is smeared on the top bun to marry all of the flavors. Make the spice blend: Mix all spices/herbs together until blended. Store in an airtight container and use on fish, poultry, pork, or beef. (Makes about 1/4 cup). In a small bowl, whisk together the mayonnaise, yogurt, lime juice, and cilantro. Cover and refrigerate until ready to assemble the sandwiches. 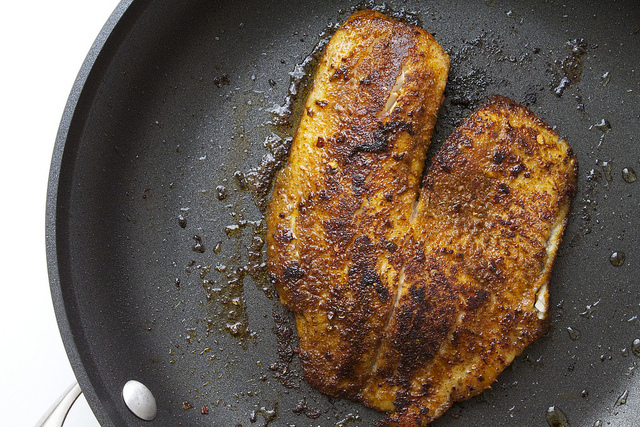 Sprinkle both sides of each tilapia filet generously with the cajun spice blend, pressing gently to coat. Put the coated filets on a plate while you make the bacon. Heat a large fry pan over medium heat and cook bacon until crisp. Remove the bacon from the pan, transfer to a paper towel-lined plate, and leave 1 tablespoon of bacon grease to the hot pan to cook the fish. Add as many of the filets to the hot pan as can fit, and cook until the underside is crisp and browned, 3 minutes. Gently flip the filets and cook for 3 more minutes. Remove the filets to a clean plate. If any filets stand to be cooked, add a teaspoon of oil to the pan, swirl to coat, and cook for 3 minutes per side. You may consider lowering the heat to prevent burning. Assemble the sandwiches by laying the hamburger buns on a clean work surface and smearing 1 tablespoon cilantro-lime mayo on the (face-up) top sides of each. On the bottom halves, layer a leaf of romaine, slice or two of tomato, 1 tilapia filet, and 1 slice of bacon (folded in half or cut in half to cover more area). Top with the mayo-smeared halves and serve immediately. Now it’s your turn: What do you make that’s just for you? Pie. In-n-out. Peanut butter-filled with chocolate frosting. Boom. In-n-Out forever and that doughnut description describes me to a T. Only snag: it’s cake. Yummmm! I’m just on the fence about talapia and will eat it occassionally, but I’m pretty sure using bacon would make me LOVE it. Thanks Katie! I hear you; I don’t eat tilapia too often either. I think this recipe would work really well with other white fish, too! Neither pie nor cake: give me cookies to express love. Doughnut that defines me? Probably the plain one with chocolate frosting and rainbow sprinkles. Classic with a little sass. Cookies. Yes. Just make sure they’re soft. Cake, taco bueno, and the cinnamon roll donuts. 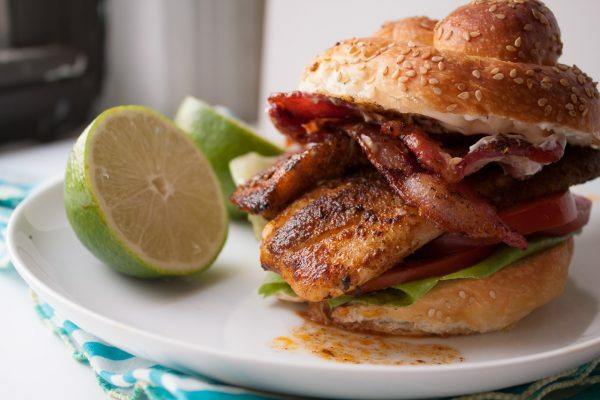 Also, I don’t even LIKE fish, but holy moly that sandwich looks amazeballs. I don’t know Taco Bueno, but I want to. Cinnamon roll doughnuts, though? Where can I get one? Wow this looks really healthy and tasty. I think it is lime that attracted me to this. That Cilantro-Lime Mayonnaise feels heavenly. This is a home run Andie. This. I’d eat this forever. My thing is this but in taco form. It’s probably been about the 25th week this year that I tell Mike “we’re having fish tacos” and he just kind of stares blankly at me. I find it’s hard to even have a food/weightloss blog when all I do is eat the same damn fish tacos all of the time. Love the photos. Most drool inducing photos on the interwebs are here. On your site. Hands down. Cajun tilapia with bacon for one might just happen tonight in my life. This looks great, Andie! This looks amazing! You can almost just taste that delicious crust on the fish. Also thank you for posting the cajun spice blend! Unlike curry powder, this homemade version seems like the better and cheaper option. Thank you Leah! Yes, I like the blend a lot and I use it on chicken all the time! Making the lime mayo right after breakfast seems more than a bit indulgent….will be great for dinner tonite!! Esp since the bacon just came out of the oven!! and the blend comes later!! Thanks!! So happy you’re making it!! Thank you! Yum! I love that I can make this just for me. Swap the tomato for avocado and you’ll have my version. You’re adorable, and I want to eat this. And yes, here I am in the midst of dating in a city with great food, and if the guy doesn’t want to take me to good foodie spots at the beginning, I seriously doubt the potential for a relationship. For example…yesterday I had a great first date that included an amazing brunch at the local modern art museum cafe and gourmet ice cream later AND he described an incredible dinner he had made the night before. Seriously hoping for a date #2. I love when you have new posts, and I love them even more when they’re recipes. Now I know what to do with that random frozen tilapia I have, thank you! Cake, specifically birthday cake with white icing, Chick Fil A, Krispy Kreme chocolate cream filled doughnut! I am having tilapia for dinner tonight, as I often do. Your version looks amazing! I would certainly judge someone by their food choices, and I don’t think I realized that until this very moment! Thanks so much, Rhonda! You described my perfect cake. And Krispy Kreme….I love Krispy Kreme. This looks SO awesome! Love all the flavors, and that fish looks so beyond delicious! And you are too right about judging people based on food preferences. I always ask people what their favorite baked good is and it always overwhelms them and gives me so much insight…haha! This looks really good! I’m normally not a huge fan of fish, but I must be starving or something because this is making my mouth water! I’m also super glad to see a recipe from you :), I love your blog, but I especially love the recipes. The petite lasagnes and tikka masala are regulars for me! Cake! ALL day long, cupcakes or cake…why the pie prejudice you ask? It’s not what pie is that’s the problem…it is what it’s not… batter, icing, my favorite brown layer left on the pan after a sheet cake is eaten. What can you make me? This please! And the kale salad. And anything really. I still dream of a grouper Reuben I had in savannah years ago…it think I always will. Possibly our second fight? I want you to completely build the sandwich to get all the sauce and everything right but I may throw out the bun and possibly run over to your friend’s house with the tacos to borrow a tortilla. Now, this depends on my will power and whether my mold allergies are already out of control I may indulge…it depends on the differential…if doing without the bread makes me feel deprived that day then it stays, if I care less about it that day I do without it. I will still love you and not deprive you of your blue cheese or bread and I will not be weird about it bc life is too short. We will make up over dessert! Can we have sprinkles? There are just too many things about this comment to love. How can I even reply? xo to all of it. Brussel Sprouts. My husband and son hate everything about them and I love everything about them. My daughter has tasted and not spit them back out at me, so that shows promise! Just found your blog. I heart it already and plan to make those buffalo egg rolls this weekend. So, my fiance and I have remarkably similar taste preferences, and I’ve even gotten him to love most veggies after a Kansas childhood of his lovely mother’s grossly overcooked plants. You should see how excited he gets when he finds good-lookin’ spring Brussels sprouts. HE JUMPS UP AND DOWN, this overly-dignified 47-year-old. He even signed off on the cauliflower-crust pizza! We both. Hate. Raw tomatoes. But once in a while, I will have this NEED for them sliced onto baguettes, covered in fresh mozzarella and basil, and made glorious beneath the broiler. I can’t explain it. Defying explanation, I love it. Must be hormonal or I’m lacking some nutrient. And that is the night he eats cereal. OH don’t forget the olive oil and S&P on that bruschetta. My bad. This recipe is AWESOME, Andie!! I’ve made the sandwich a couple times, and it’s so full of flavor. I’ve recently been watching my carb intake, and the cajun tilapia is also delicious on it’s own with just the cilantro-lime mayo. I’ve also found that the leftovers reheat surprisingly well for lunch the next day. 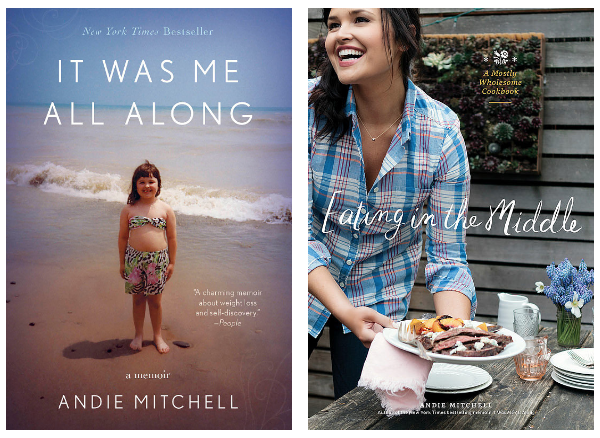 As always, thank you for your fabulous recipes, skilled writing, and ongoing inspiration. I’m so happy to hear this, Christina! Thank YOU!! From Cajun country, this looks delicious! Want eat the bread but may try with wrapping in lettuce. This recipe was amazing! My husband and I loved it, including all of the spiciness! The bacon and lime mayo MADE it. Yum, Yum, Yum. We will definitely put this one in our forever cookbook! I’m so glad you both liked it, Amy!! Thank you!